To be honest until about a year ago I didn't know a great deal about hip hop. I knew it was a dance style, of course, but I had no understanding of the art, culture, history and community of the hip hop genre. Thanks to local group Northern Elements Crew my eyes have been opened to the beauty of hip hop, and the value of our local hip hop group. We are a group of like minded individuals with years of experience in dance and other forms of artistic expression. We hope to be able to share our passion for Hip Hop with others to create a community in which we all can learn from each other. 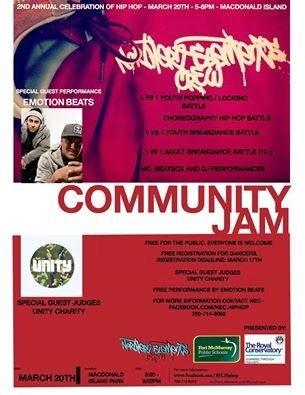 • To create a self-sustainable Hip Hop community within Fort McMurray by promoting the foundations of Hip Hop culture to youth and young adults. • To provide young adults an outlet for expressing themselves through the elements of Hip Hop. Having had the opportunity to spend some time with NEC and witness their success I believe their impact is going far beyond their mission, because I truly believe NEC is creating future leaders of our community by engaging youth through hip hop. Through a philosophy of "each one teach one" and developing an atmosphere where every individual is both student and teacher, they are helping youth to learn new skills while teaching others ones they know, and building leadership skills. The ability to engage youth through a common interest and one that appeals to many youth, the athletes, mathletes and those who are neither, has meant that NEC has not only built a hip hop community but a youth community. A year ago I knew nothing about hip hop - and now, thanks to NEC, I am a convert and a complete believer that this group has the potential to powerfully impact young lives, and create a community where each youth can achieve their potential and shine, on and off the dance floor. This week you have an opportunity to see NEC in action when their Second Annual Community Jam comes to MacDonald Island on Thursday evening. I can guarantee it will be an evening of enthusiasm and energy as the hip hop community comes together to celebrate and "battle" out their dance skills. I can also guarantee that if you attend you will quickly realize you are seeing something special, almost magical. I can guarantee you will see local youth who have found a community, a support system and a place where they are encouraged and where their development as dancers, leaders and citizens is fostered. Northern Elements Crew might look like a hip hop dance group - but the reality is they are so much more, which is why I am a committed fan of what they do. They aren't just dancing, you see. They are quietly helping local youth lead us into our future, one community jam at a time.